Electric current, voltage and resistance are quantities we experience in everyday life, from power lines to wall outlets. And in many applications, they can be described adequately by the 19th-century laws of classical physics. But does their time-honored interrelationship, described so succinctly by Ohm’s law, remain true even in tiny physical systems, ones that operate according to the strange rules of quantum physics? Finding out will require experiments in which voltage, resistance and current are all exactly defined according to the principles of quantum mechanics. At present, these experiments are possible in practical terms for the volt and the ohm. Although both are derived from other SI units according to their present formal definitions, their actual magnitudes are based on two quantum electrical phenomena that depend on fundamental constants. One is the Josephson effect, predicted by physicist Brian Josephson half a century ago, and confirmed shortly thereafter. It occurs when two superconducting electrodes are separated by a tiny gap or barrier. (That configuration is called a Josephson junction.) In ordinary electric conductors like metal wires, current only moves when pushed along by a voltage. In superconductors, however, current can flow across the barrier in the absence of any applied voltage, thanks to interactions between pairs of electrons governed by the rules of quantum mechanics. Closeup of a modern Josephson junction..Josephson junctions are formed in the circular pits (they look a bit like an element of a muffin tin) where the two layers overlap (green). But if a superconducting junction is exposed to electromagnetic radiation such as microwaves, then a “quantized” voltage develops across the junction that is proportional to the frequency of the radiation. That proportion is expressed by the Josephson constant KJ = 2e/h, where e is the elementary charge and h is the Planck constant. “Quantized” means that only specific values of voltage can exist, proportional to those constants, instead of a continuous range of values. Because radiation frequency can be controlled with extraordinary precision, a Josephson junction can produce exact levels of voltage, with uncertainty in the range of 6 parts per billion. Not surprisingly, Josephson voltage standards have become the de facto universal tools for calibrating voltage measurements. 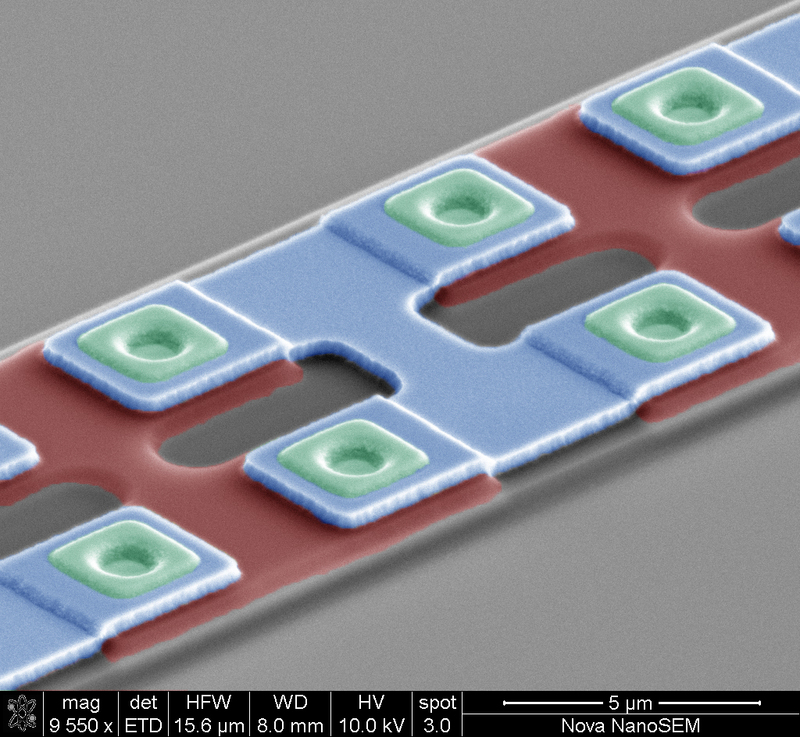 The other phenomenon is the quantum Hall effect: When a current of ultracold electrons — so thin that it is, in effect, a two-dimensional sheet — is exposed to a magnetic field perpendicular to the sheet, electrical resistance across the width of the current stream develops in exactly quantized steps. The magnitudes of those steps are described by the von Klitzing constant (RK = h/e2), named after physicist Klaus von Klitzing and known to an uncertainty of 2 parts in 10 billion. The quantum Hall effect is the world standard for resistance calibration. Ultraprecise electrical measurements require extremely stable temperature, humidity, and vibration control. 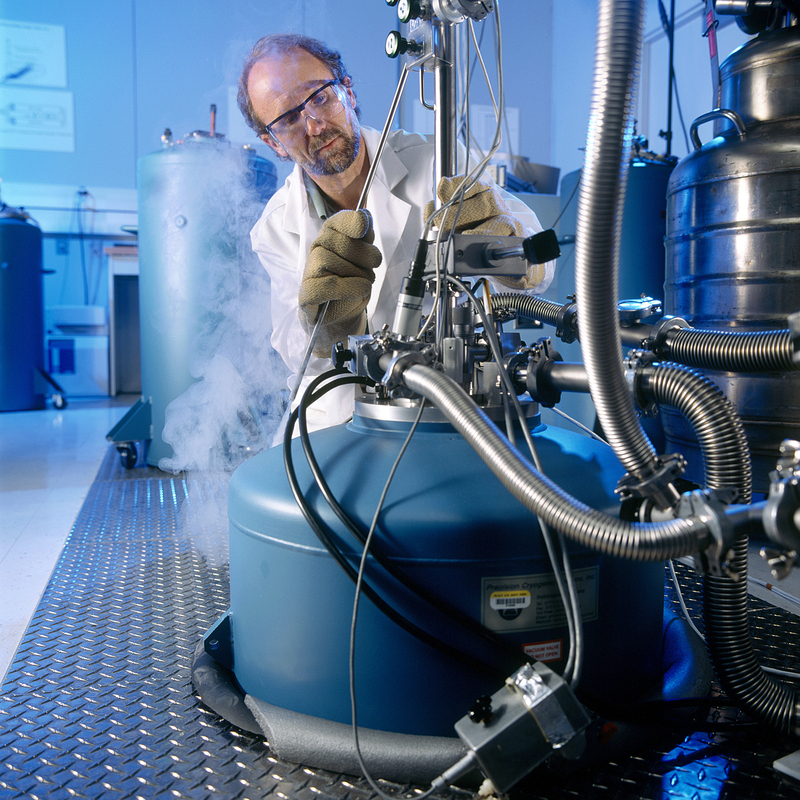 In this photo, NIST physicist Rand Elmquist fills a cryogenic chamber with liquid helium in preparation for measuring the quantum Hall effect. The values of the Josephson and von Klitzing constants were initially determined by experiment. But the constants are so important to electrical metrology that in 1990 they were incorporated into the SI as “conventional” units — that is, their values are now exactly fixed by international consensus with zero uncertainty. And therein lies the roots of what has been a strange situation. The standard values of the volt and ohm currently exist in some sense outside of the SI. They depend primarily on values of constants different from the ones upon which the redefined SI will be based. A NIST Josephson voltage chip next to a penny. In the planned 2018 SI redefinition, however, that would change immediately. KJ and RK would be defined in terms of h and e — both of which will be assigned exact fixed values. Therefore, KJ and RK will also have exact “true SI” values instead of the conventional 1990 values. When the ampere is redefined in terms of e, all three components of Ohm’s law will finally be formally interconnected by only two fundamental constants: h and e. Scientists will be able to use the Quantum Metrology Triangle (Ohm’s law in quantum terms) to check the values of current, voltage and resistance by using any two units to determine the value of the third. That will reveal, for example, whether the Josephson constant really is exactly equal to 2e/h. Any discrepancies would have a major impact on electrical metrology — not to mention quantum theory itself.